Dark spots and bumpy patches on the skin affect a lot of people and are very common. Such conditions may be caused by extended exposure to the sun, irritation, or dry air. Two popular products for dealing with such conditions are Glytone vs Amlactin Body Lotion. Below, we will compare these two products to find out which one is better. Although harmless, dark spots and bumps on the skin are very annoying. This condition is known as keratosis pilaris. It may happen on any part of the body, but the most common occurrence is on the upper arms, buttocks, and thighs. It may appear on the face, but this is less common. See also: Aquaphor vs Aquaphor Baby. At worst, keratosis pilaris may have some mild itching. It will not hurt or cause a more dangerous problem. However, some people become unconfident because of the appearance. This is why, although the condition is harmless, most people want to get rid of it as quickly as possible. The condition is actually caused by the buildup of keratin. You are probably familiar with the name. Keratin is a protein which builds up the hair and nail. In the skin, keratin is responsible for protecting the layer against infections and other harmful agents. However, keratin buildup may block the opening of a hair follicle, hence triggering the condition. Keratosis pilaris is more likely to happen on dry skin and in the winter, when the air has less moisture. Keratosis pilaris doesn’t have a cure, but the appearance and texture of the affected skin area can be improved with a lotion or cream like Glytone vs Amlactin. These products are topical exfoliants. They work by removing dead skin cells so that the area can be less bumpy and have a more even color. Glytone Body Lotion is a topical exfoliant that mainly relies on its high concentration of glycolic acid. As a matter of fact, glycolic acid belongs to the alpha hydroxyl acid (AHA) family of exfoliating agents. Glycolic acid is naturally found in pineapples, beets, and sugar canes. Compared to other exfoliating agents in the group, glycolic acid has the smallest molecule size. As the effect, glycolic acid can be absorbed more quickly into the skin and deliver results in less time. However, glycolic acid is slightly harsher. It is more irritating, and it may cause a burn on sensitive skin. Other ingredients of Glytone Body Lotion include water, propylene glycol, glycerin, cetearyl alcohol, potassium hydroxide, petrolatum, allantoin, tocopheryl acetate, propyl gallate, and PEG-40 stearate. Glytone Body Lotion is fragrance-free, so it will not emit any dizzying scent. Amlactin Body Lotion uses 12% lactic acid to do the job. It claims that this ingredient has been clinically proven to be able to boost the natural renewal process of the skin to provide softer, smoother skin through gentle exfoliation. Lactic acid also belong the alpha hydroxyl acid (AHA) family. Lactic acid is acquired from milk. Compared to glycolic acid, lactic acid is slightly gentler. This ingredient is less irritating and is less likely to cause a burn. 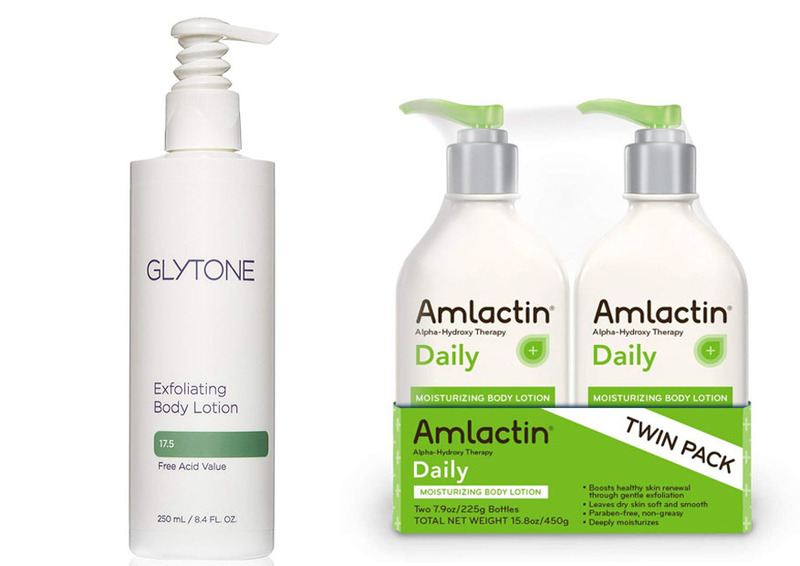 Other ingredients of Amlactin Body Lotion include water, mineral oil, dimethicone, glycerin, stearyl alcohol, steareth-21, steareth-2, glyceryl stearate SE, xanthan gum, and potassium sorbate. Amlactin Body Lotion is fragrance-free and paraben-free. 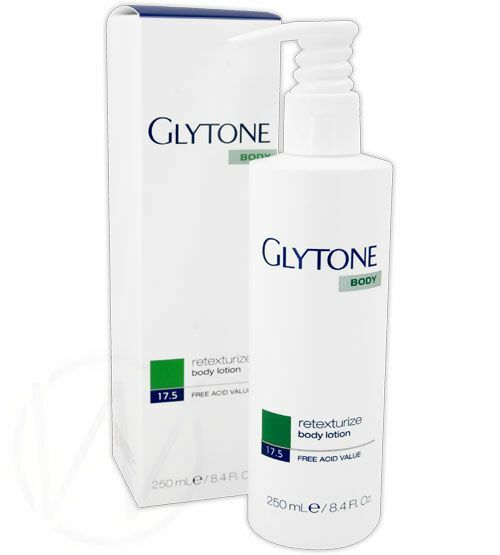 Glytone Body Lotion recommends that you use it on a daily basis on the skin area that requires the treatment. However, it is not recommended for the face. It is also not recommended for use after a hair removal treatment or after shaving. Use just enough amount of the lotion. It is also mentioned that this product increases your skin’s sensitivity to the sun. You should avoid or limit your exposure to the sun while using Glytone vs Amlactin Body Lotion and for one week after you stop using the product. If you need to go out, you should use a sunscreen or wear protective clothing. Before using Amlactin Body Lotion, you should shake the bottle well. It recommends you to use the product two times a day, or as directed by your physician. It is also not recommended for the face. Because it also increases your skin’s sensitivity to the sun, you should also take similar precautions; avoid or limit sun exposure, and wear a sunscreen or protective clothing when you need to go out. Glytone works great. The formula is definitely very effective for exfoliating the skin. When applied, it will sting a bit. However, the dark spots and bumps will be gone within a few days. If you are looking for the fastest solution, Glytone is a decent choice. However, there are still some things that you need to consider. First, Glytone has a thick texture, and it may be a bit greasy. So, be careful when applying the product so that you don’t cause a mess. Second, it is quite harsh. It should not be applied to sensitive or damaged skin, otherwise the burn will hurt. Amlactin is also highly effective for removing dark spots and bumps. Many people have been satisfied by the performance. It is a bit slower than Glytone, but it delivers impressive results in the end. The nice thing is that, in addition to being fragrance-free, this product is non-greasy. The texture is not excessively thick, and it can be applied without leaving a greasy surface. Amlactin is a bit gentler, but it still stings a bit. Both Glytone and Amlactin should not be used on sensitive skin. When used on sensitive or damaged skin, they may irritate very much and cause a burn. Glytone may have more intense side effects because the main ingredient is harsher. Amlactin is slightly subtler, but it is still considered harsh if compared to regular exfoliants. In general, Amlactin Body Lotion is more recommended. It uses a gentler exfoliant, which is slightly less irritating. It will not sting as much, but it is also highly effective for removing dark spots and bumps. In addition, it is fragrance-free, paraben-free, and non-greasy, so it is more convenient to use.